The Purple Pomegranate, a fine craft specialty store, is featuring work by Lakeside artist Dixie Wajdic during the month of July. Dixie uses the beauty of the Flathead Valley’s lakes and mountains to help inspire her to create products which preserve the history of the Old West and Montana’s Heritage. These items make great gifts for those who have a home with rustic decor, for those who love the outdoors and for the people who have everything. The Boundry Line, Dixie’s company, specializes in creating one-of-a-kind wood items using the natural beauty of old juniper and cedar fence posts that have since been replaced. 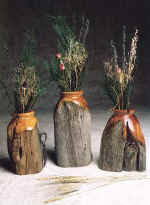 She creates vases, oil lamps, votive candle holders and lamps. Each piece is unique and some even still have moss growing on them. Dixie’s use of old fence posts is certainly a “green” way to create a beautiful work of art that is functional and eye catching. Dixie’s work will be featured for the full month of July and on Gallery Nights which is August 7, 2008 from 6:00 to 9:00 pm.